This was a five day cruise to Bermuda from Cape Liberty, New Jersey, which is in the port of New York. 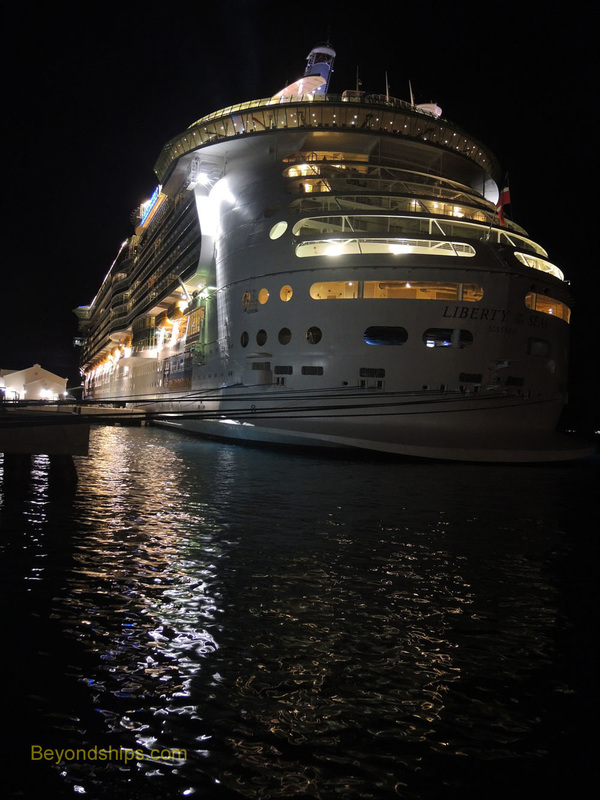 Although Liberty of the Seas entered service in 2007, she remains one of the world's largest cruise ships. She can carry a large number of people. At the same time, she has a wide array of facilities to keep her passengers happy. Liberty provides a family-orientated cruise experience similar to the cruise experience that was offered on Royal Caribbean's long-time port of New York ship Explorer of the Seas. It is a less sophisticated experience than provided on Liberty's immediate predecessor in Cape Liberty Quantum of the Seas. Both are good experiences, they are just different. Inasmuch as the school year had just come to an end, there were many families with children aboard. Along the same lines, there were quite a few mufti-generational families aboard The vast majority of the passengers were from North America. The interior of the ship is flashy and exciting. Her centerpiece is the Royal Promenade - - essentially a street that runs down the center line of the ship, complete with shops, restaurants and bars. There is even a reproduction of an antique Morgan car parked in front of the wine bar. The lighting changes during the course of the day from mellow in the morning to theatrical in the evening. Often whimsical works of art add to the lighthearted atmosphere. Upstairs on the open decks are three pools - - one for kids, one for adults and the main pool. There is also a surfing simulator, a basketball court and various other sports facilities. These facilities were very popular throughout the cruise, only becoming quiet and empty after dark. Even though this was a short cruise, Liberty put on a full program of entertainment. On the Royal Promenade, there was a parade featuring the characters from the Dreamworks films. There was also a 70s dance party. In the main theater, the ship's singers and dancers performed a standard cruise ship production show early in the cruise. Later in the cruise, they performed a version of Saturday Night Fever. Both shows were well-executed. However, despite the Bee Gee's music, Saturday Night Fever is too insipid for my taste. The theater was also the venue for the popular Love and Marriage game show as well as for some visiting performers. Illusionist Jason Bishop put on an impressive show. Liberty also staged four performances of its ice show Encore during the voyage. This enabled everyone who wanted to see the show to do so. And it was well-worth seeing. The unifying concept was a trip around the world of entertainment. The skaters performed to Broadway tunes, rock anthems and Las Vegas standards. Their performances were top notch as was the lighting and sound. Turning to dining, Liberty has a main dining room, two specialty restaurants and several alternative venues. The food in the main dining room was good including a memorable eggplant parmigiana. However, for an excellent meal, the Chops Grille steakhouse and the Italian-themed Portofino are the places to go. (Liberty has one of the last Portofino restaurants in the Royal Caribbean fleet). And the 1950s-style hamburger diner, Johnny Rockets, is always a fun experience. The service on Liberty was good. Furthermore, the crew seemed in amazingly good spirits despite all of the work that had to be done to keep so many people happy during such a concentrated voyage. Where do they get all that energy? Liberty appeared to be clean and well-maintained. Every five years, ship owners are required to drydock their ships. Royal Caribbean has been upgrading its ships as they come in for these refits. It has been several years since Liberty's last drydock and so she does not have all of the features that have been added to the Royal Caribbean ships that have recently gone though this process. Hopefully, Liberty will get a revitalization similar to that recently given to Explorer of the Seas when Liberty's turn arrives. (See review of Explorer). We arrived in Bermuda on a national holiday. As a result, many businesses were closed and many of the locals were taking advantage of the good weather to go to the beach. As a result, Bermuda's premier beach, Horseshoe Bay, was quite crowded. However, if you walk eastwards from Horseshoe Bay, you come to a series of more secluded beaches with fabulous rock formations. (See article on walking the South Shore beaches). The Bermuda government runs a shuttle from Dockyards to Horseshoe Bay that is nine dollars a person round trip. The second day, I visited the Bermuda National Museum, which is in the fortress adjacent to Heritage Wharf. Although the Commissioner's House was closed, some new areas of the fortress have been opened. Also, the views from the fortress walls are quite good. You can even view the dolphins frolicking at the Dolphin Quest. The only real negatives about this voyage were the embarkation and the disembarkation. Replacing the old make-shift cruise terminal at Cape Liberty is a new state-of-the-art facility. Still, the embarkation process seemed confused. Lessons could be learned from the operations at the terminal used by the Oasis-class ships in Fort Lauderdale and the City Terminal in Southampton. Because this was a relatively short cruise, a large number of passengers chose to carry off their luggage when departing the ship. The numbers simply overwhelmed the operation and there was confusion and long lines. Liberty experienced good weather throughout this cruise and so her seakeeping abilities were not tested. She maintained a relatively fast pace while at sea. In addition, she was able to thread her way through the reefs that surround Bermuda. In sum, Liberty of the Seas remains an enjoyable experience, particularly for those with children and those seeking an active vacation.